Somehow you get the prompt The requested operation requires elevation sometimes when you try to execute some Windows network programs or run some network commands in command prompt, and you might wonder what is this and not too sure what to do next. This is actually part of the User Account Control (UAC) feature of Windows Vista that controls the program execution as normal user, administrator or other user types with different access control. You will get this prompt because that program will need to be run as administrator, so the quick way to fix it is re-run by right clicking the program and select Run as administrator. This alert message will come out sometimes even you run that program with administrator user id, this is because the Vista won’t tell you sometimes when that program needs to be run as administrator. If you don’t like this UAC feature, you can actually disable it, you can follow the following ways to disable it. For a better security, next time only log on as normal user to do routine works and use administrator access if you need to run Windows operation or program with admin privilege. 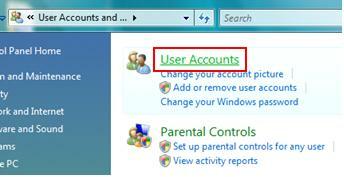 1) Go to Start -> Control Panel, then click on User Accounts and Family Safety. 2) After that click on User Accounts. 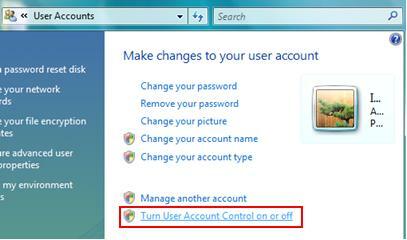 3) Click Turn User Account Control on or off in User Accounts window. Note: If you are using Control Panel in classic view mode, you can come to this page by going to Start ->Control Panel -> User Accounts. 4) Uncheck Use User Account Control (UAC) to help protect your computer and click OK at last. Note: You need to to restart the computer in order to disable the UAC feature successfully. Return to top of What to Do with "The requested operation requires elevation" in Vista! !